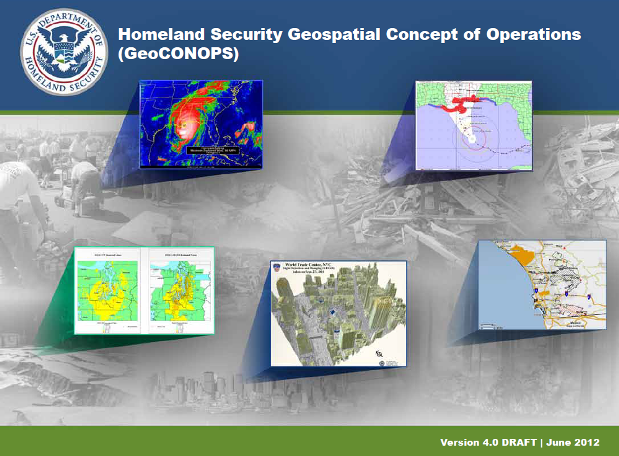 This draft Geospatial Concept of Operations (GeoCONOPS) has been developed as a starting point for understanding how the coordination of disaster response geospatial activities can be improved at the Federal level. The intended audience for this draft document are the geospatial communities that support emergency management activities of the Federal government under the National Response Framework (NRF). This includes individual Emergency Support Functions (ESFs), the Joint Field Offices (JFO) and operations centers, including the National Response Coordination Center (NRCC). Stakeholders and actors representing ESFs, operations centers, and involved in other NRF activities have been extensively engaged in providing input for this document. 1.) Please note this document represents an effort to coordinate geospatial efforts among Federal partners. States and metro regions will need to develop their own Geospatial CONOPS to sort out relationships on those levels.